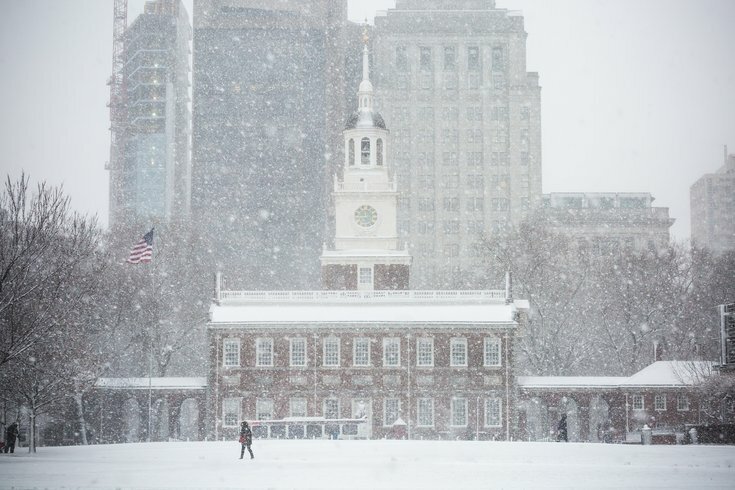 Snow covers Independence Mall in Old City, Thursday, Feb. 9, 2017. The precipitation falling across the suddenly balmy Philadelphia region on Friday will likely end before temperatures plummet on Saturday morning, so no snow on Gameday, but there is a potential for snow accumulation on Tuesday or Wednesday. Forecasters say the temperatures look to drop from the 50s to the 30s in just a three-hour period. By the time the Eagles take the field at the Linc for a 4:20 p.m. playoff game against the Atlanta Falcons, the mercury will show around 33 degrees. Temperatures will fall further as post-game celebrations gear up at night. The cold is expected to hang around through Tuesday and Wednesday, when a clipper system moves eastward into the region. A European model sees the clipper moving to just off our coast, favorable conditions for strengthening and then spreading precipitation across the area, according to the National Weather Service. Given the uncertainty of the upper-level trough the weather picture is cloudy, but there remains a chance of a couple of inches of snow on Tuesday, or Wednesday if delayed, forecasters say. Friday night: Showers likely before 7 p.m., then rain thereafter. Low around 36. South wind 6 to 10 mph. Chance of precipitation is 90 percent. New precipitation amounts between a quarter and half of an inch possible. Saturday: A chance of rain, mainly before 10 a.m. Mostly cloudy, with a temperature falling to around 33 by 5 p.m. Northwest wind 14 to 16 mph. Chance of precipitation is 50 percent. New precipitation amounts between a tenth and quarter of an inch possible. Saturday night: Partly cloudy, with a low around 14. North wind 13 to 15 mph. Sunday: Sunny, with a high near 27. North wind 10 to 13 mph. Sunday night: Mostly clear, with a low around 16. M.L.King Day: Mostly sunny, with a high near 31. Monday night: A chance of snow after 2am. Mostly cloudy, with a low around 24. Chance of precipitation is 30 percent. Tuesday: A chance of snow. Mostly cloudy, with a high near 35. Chance of precipitation is 40 percent. Tuesday night: A chance of snow. Mostly cloudy, with a low around 21. Chance of precipitation is 40 percent. Wednesday: A chance of snow. Mostly sunny, with a high near 28. Chance of precipitation is 30 percent. Wednesday night: Partly cloudy, with a low around 16. Thursday: Mostly sunny, with a high near 29.